Experience Spanish 1 Edition Your students are changing. Technology is changing. The idea of the “classroom” is changing. Now, the way your students experience Spanish can change as well!At McGraw-Hill, we rededicated ourselves over the past few years to broadening and deepening our understanding of the student and instructor experience in World Languages. Employing a wide array of research tools including surveys, focus groups, and ethnographic studies, we identified a number of areas for improvement upon the existing learning materials available. The result is Experience Spanish.Experience Spanish is a first. Its groundbreaking adaptive diagnostic and synchronous/asynchronous conversation tools create a 24/7 active language-in-culture environment never possible before. With Experience Spanish, instructors can tailor the environment while students tailor the experience, allowing everyone to take ownership of the learning experience.Affording the flexibility that only an integrated solution can provide, Experience Spanish provides an opportunity for instructors to quickly and easily provide a common learning experience for their students regardless of whether the course is face-to-face, online, or hybrid. At the same time, students have all of the tools at their fingertips to take their second language acquisition from the classroom to their communities in an efficient and personalized way. With Experience Spanish, your concerns about different levels of student preparedness and delivering consistent and meaningful courses in different formats are behind you.Own the experience. Take charge of learning. 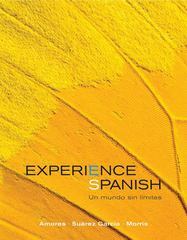 Experience Spanish and experience the world. *Connect Spanish, including but not limited to the workbook/lab manual, LearnSmart, the video program, and chat tools, is sold separately and does not come automatically with the purchase of the textbook.